Sierra Smith had heard gunshots in the neighborhood before, but never this close. The longtime Ferguson, Missouri, resident was on her way to a nearby park with her two children when they heard the first shot. At first, she thought it was a firecracker, but it was louder than that. It echoed. Smith ran with her son and daughter, then 6 and 4, to her cousin’s apartment nearby. Growing up, Smith was taught to hit the floor and stay there until the gunshots stopped or the sirens began. When the noise stopped, she made her way back outside. There, just outside the complex on Canfield Drive, Smith saw a police officer, gun still in hand, ordering people onto the sidewalk. And then she saw him: “Mike Mike,” a teen from the neighborhood who had played in her apartment, face down on the asphalt. There was no police tape yet to isolate the crime scene, and no sirens in the distance. When Ferguson authorities arrived at the scene of the Aug. 9, 2014, shooting, they found Michael Brown’s belongings scattered around a police SUV: a red St. Louis Cardinals baseball cap, two bracelets and a pair of Nike sandals. Closer to Brown’s body, they found most of the casings from the 12 bullets Officer Darren Wilson had fired. State violence is not new to black people. It’s just something was different about how Michael Brown was killed. It wasn’t until 4:37 p.m. that day — more than 4.5 hours after Smith heard the gunfire – that medical workers finally transported the body of the 18-year-old black teenager to a morgue. As more people in the neighborhood gathered at the police tape, outrage grew at the sight of Brown’s body, uncovered and exposed in the summer heat. Police eventually laid a white sheet over the body, but Brown’s feet stuck out. Blood trickled from the other end, running along the yellow lines of the two-way road. The image was captured from various angles as bystanders uploaded pixelated cell phone videos and photos to social media. Before police could put up orange screens to further hide the body from view, the image was tweeted and then retweeted. It quickly drew national attention. He drove to Ferguson to learn more. Once there, he started tweeting nearby West Florissant Avenue, a street near Canfield that would become the main site for protests and clashes between law enforcement in the weeks of unrest that followed. French’s videos are among the images that have become inextricably linked to the city of Ferguson, a shorthand of sorts for understanding the anger behind the escalating demonstrations: “Hands up, don’t shoot” chants, protesters facing frontline officers, the dogs, armored vehicles, the local QuikTrip burning. Kinnie, 17 at the time, had lost his mother to breast cancer a month prior. Already in a state of depression and anxiety, Kinnie came across the image of Brown’s body on Instagram. That summer, Kinnie led a series of student protests and encouraged his peers to promote social justice in their communities. The Ferguson protests would offer a model for other movements in the larger St. Louis area, elsewhere in Missouri, and in other cities such as Washington, D.C., Baltimore and Cleveland. The outrage that fueled the protests was complicated, French said. 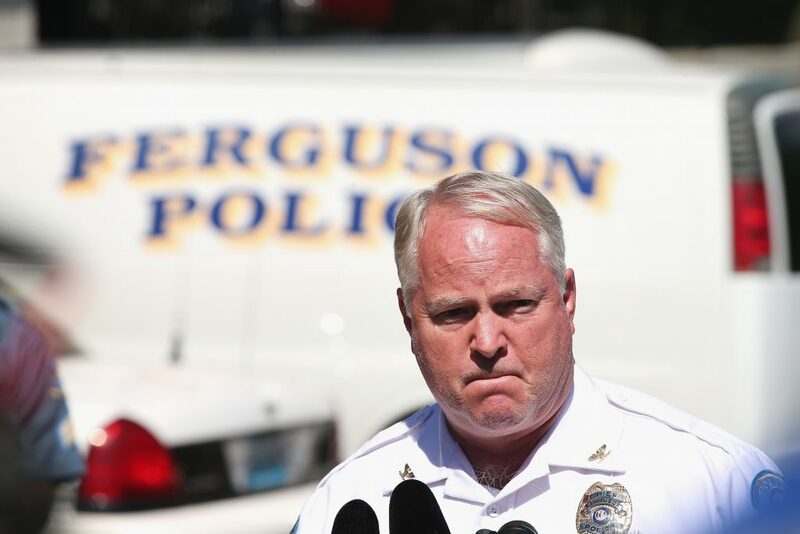 Social media accounts of the shooting’s immediate aftermath undersold the chaos police faced, said Thomas Jackson, the Ferguson police chief at the time of the shooting. Jackson said several reported gunshots nearby upended the forensics team’s ability to thoroughly process the scene. “Each time that happened, it became an insecure scene,” furthering delaying the process, he said. “And that’s not an excuse — that’s just — that’s what happened,” he added. If he could change one thing in the initial hours after Brown was shot, it would be moving the body sooner, Jackson, 60, said. But Jackson, who’s lived in and around Ferguson since he was 10 years old, told the NewsHour that he was hamstrung by protocol; touching the body before the scene was properly processed could be considered police misconduct, he said. Months after Brown was killed, a grand jury in St. Louis County declined to indict Wilson in the teen’s death. Months after that announcement, the Department of Justice said it would not bring civil rights charges against the officer. At the same time, the DOJ released a scathing report that called for the Ferguson Police Department to overhaul its criminal justice system. DOJ sued the city in 2016 to force the reforms. The report said Ferguson’s police force and court systems systematically violated the rights of African-Americans, who were disproportionately the target for traffic stops, arrests and expensive fines. However, some Americans saw the federal government’s scrutiny of Ferguson’s police department as a move that undermined police officers and enabled criminal behavior. During his campaign for the presidency, Donald Trump tapped into the notion that the federal government failed to support law enforcement in the country, a concern that persists to this day. A July 2017 Harvard-Harris poll showed 62 percent of Americans feel that the public focus on law enforcement behavior has diminished how well police can do their jobs. President Trump has changed how the DOJ approached the issue of police misconduct. Attorney General Jeff Sessions, now head of the same federal agency that issued these legal reform agreements with troubled police departments, has been critical of the police oversight that was pushed under former Obama. Every step I took and every decision I made that afternoon was by the book. I followed procedures and protocols designed to ensure the fairness and transparency of investigations. … And yet, nearly every one of those moves backfired in some way. “Since then, Ferguson has become an emblem of the tense relationship between law enforcement and the communities we serve, especially our minority communities,” Sessions said in a visit to St. Louis in March. Jackson downplayed the idea of a disconnect between the Ferguson police department and the citizens it swore to protect, saying that many of his police officers were involved with the community before the shooting. Jackson did concede that the department was ill-equipped to handle the deluge of social media that documented every step the police took, especially in those first few hours after the shooting. Now, three years later, Ferguson has seen some changes. The city council, once overwhelmingly white, is more diverse. Community activists have moved from demonstrations in the streets to becoming aldermans or representatives of the city. Despite the Trump administration’s signals to change the federal government’s approach to police reforms agreements, known as consent decrees, Ferguson officials have said they’ll continue to work with the DOJ on improving their recruiting and hiring practices, and use-of-force guidelines, the Post-Dispatch reported. The St. Louis Urban League also recently built a resource center where the neighborhood QuikTrip used to be. The convenience store was burned down by protesters days into the unrest that followed the shooting. That type of “community empowerment” is a step in the right direction, but more must be done, said Clifton Kinnie, who has continued his activism at Howard University in Washington, D.C., where he is a rising junior and political science major. A community’s safety doesn’t hinge on better policing alone, the young activist said; it’s also about seeking political power, raising the minimum wage, Medicaid expansion, investments in schools and job training. 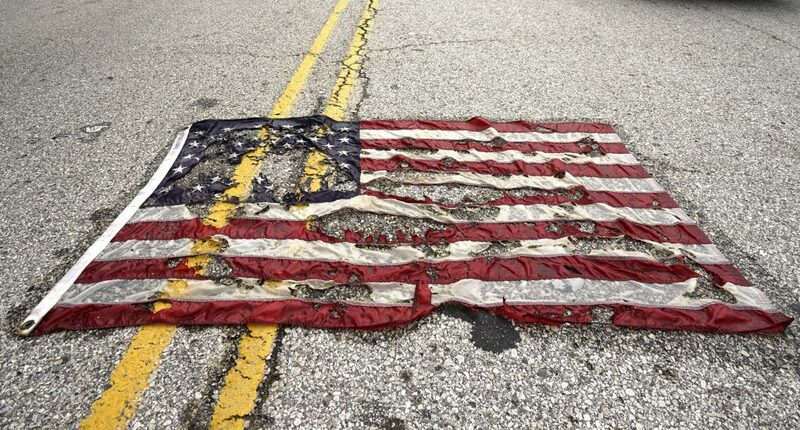 Fifty years from now, people are going to see Ferguson as everything that’s wrong with America or they’re going to see Ferguson as the symbol for a great hope of what American can be, Kinnie said. Brown’s parents did not speak at their son’s funeral, but did write letters that were read to thousands of mourners. “The day you were born I just know God sent me a blessing and that was you,” Lesley McSpadden, Brown’s mother, wrote. At his funeral, Brown’s casket was bookended by enlarged portraits of the teen wearing headphones. Red roses sat atop the casket. To the left of the flowers was a St. Louis Cardinal baseball cap, black and red.